Star Wars and I are on difficult terms. I’m kinda iffy on the movies, disliking the prequels and tentatively enjoying the original trilogy, but not nearly as much as what geek culture tells me I should. The extended universe, meaning books, series, comic and, most importantly, video games, however, I absolutely adore (too bad all of that is non-canon now. Thanks, Disney.). The novels are hit-and-miss, with some truly not being much more than glorified fan fiction, but there are a few genuinely great EU books out there, and the same goes for the comics. The games, though? Damn, the games. There are so many good to great to absolutely legendary Star Wars games out there. There’s the obvious KotOR, Republic Commando, Battlefront II, personal favorites like Galactic Battlegrounds and The Force Unleashed (sue me), and then there are the old classics like Tie Fighter, and Dark Forces, which ended up spawning one of the most recognized series of games in the Star Wars franchise. For a time when my exposure to retro games wasn’t nearly as extensive as I would have liked, I’ve always viewed the sub-genre of Doom clones, or “Doomlikes” with fascination. Dark Forces is one such game, and I am happy that it was my first Doomlike, as it works as a good transition. Features like multi-leveled maps and the ability to look up and down *gasp* make the game much more accessible for the young’uns like me. A gateway game, if you will. This game here is a textbook example of retro. There are several mods out there for control scheme modernization, as well as graphical touch-ups, but for the sake of authenticity I played the game with the default features (though some minor tweaking in the graphical area was needed for the thing to run at all, but that was just stuff edited in the config). Star Wars: Dark Forces is a 2.5D game running on Lucasarts’ proprietary Jedi engine, and follows the exploits of a Stormtrooper-turned-mercenary-turned-rebel(-turned-Jedi-turned-mercenary-turned-Jedi… it’s complicated) Kyle Katarn. The game is played through a sequence of missions structured in a linear manner. 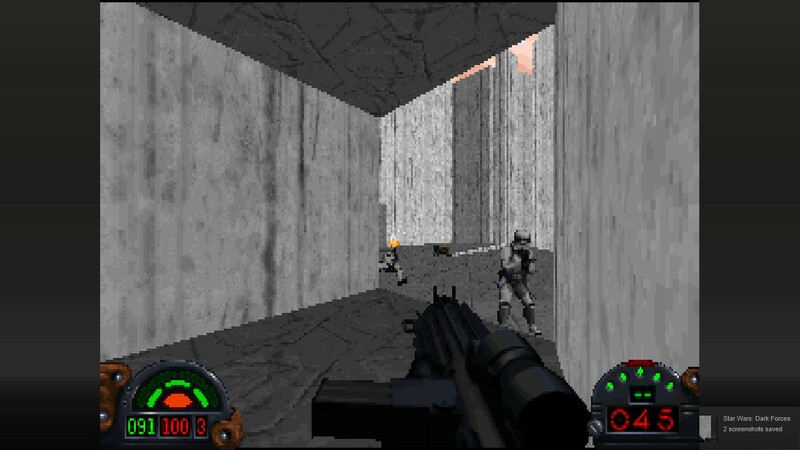 The maps brought the innovation of multi-leveled constructions to the FPS genre, and the placebo ability of looking up and down, though this was accomplished by “cheating”, and there is no perspective correction, so its best avoiding this unless you need to shoot down some grunts up on ledges. Weapon sprites have also moved to the right side and angled to the center as opposed to pointing out from the middle of the screen. There is no targeting reticle, rather the weapons auto-aim if you’re pointing approximately at an enemy, but don’t mistake this game for one that won’t kill you repeatedly. 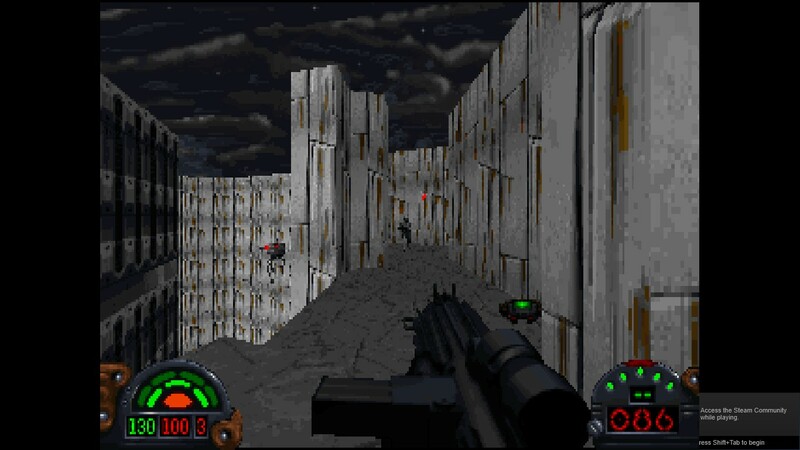 Dark Forces starts off pretty easy, and at first the difficulty curve is pretty level, but there is a point where there is a sharp spike and suddenly the game is a lot harder. Auto-aim or no, the lack of ammo and sparity of health/shield pick-ups do make things perilous going forward, and the strange save-system makes progression a chore if you’re low on supplies and respawns. The save-system does a thing that isn’t really beneficial to the experience – there isn’t one. Basically, there are occasional checkpoints during a mission, of which you aren’t informed when you reach one, and you have a limited amount of respawn opportunities. You die, one “life” is deducted. You hit zero, start the whole level from the beginning, so they tacked arcade mechanics on a PC game where you don’t throw in a quarter each time you bite the dust. This game certainly isn’t here to hold your hand. Kyle can carry a wide assortment of weapons all at one time, with various ammo-compatibilities, and firing types. Whilst you’re fighting a large number of Stormtroopers, finding ammo for your E-11 should not be an issue. However, when bumping into enemies carrying specialized ammo or nothing at all, supplies can get really tight and really rare. As for the gameplay itself, you (vaguely) point your gun(s) towards whichever person you want to go away, and press the shoot button until thy’re not hurting you anymore.There are quite a few weapons, all with their own secondary fire mode. That large arsenal would go unused for the most part, and usually levels contain sufficient E-11 ammo, and the flashy four-barreled slimeball spitter will be only used on bosses. Occasionally the flow is broken up with a “puzzle”, but these involve shooting the right guy and then pilfering his corpse for a little picture that tells you the exact solution, so it isn’t anything beyond adding a middle man to the business arrangement between bullet and success. Basically the only interaction you have with the game-world is killing things. And that’s okay. The story begins with Kyle Katarn stealing the Death Star plans prior to the events of Episode IV. This prologue mission sets up Kyle’s affiliation with the Rebellion as a loose one. Afterwards, he is once again employed by the Rebellion to investigate an attack on one of their bases, during which Kyle uncovers the top secret imperial Dark Trooper project. The Dark Troopers are a new breed of combat droid, dressed in similar armor as the stormtroopers, except all black, equipped with a jetpack, and considerably resilient (Meaning it is a tad more effective than plastic). The subsequent missions see us travel all over the galaxy, trying to find out as much information about the Dark Troopers and their weaknesses as possible in order to shut the project down for good. As you might have deduced from all of the above, this game isn’t particularly story heavy, and it isn’t particularly strong on the writing side of things either. The story is kind of just… there. 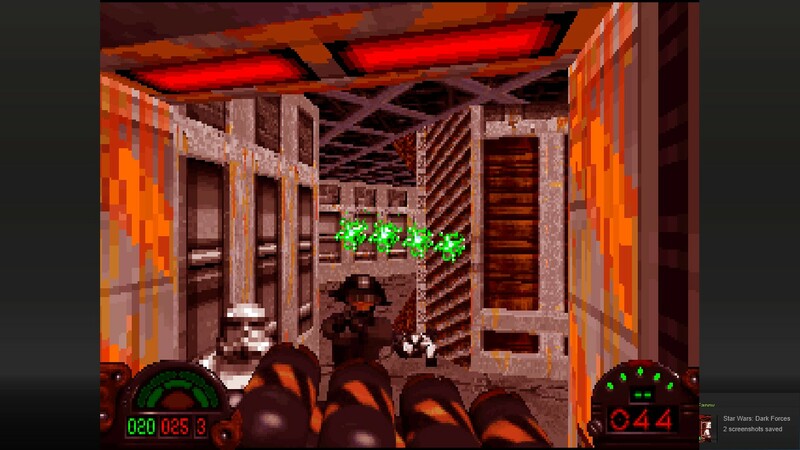 Star Wars: Dark Forces is a fun but forgettable little game. It’s clear that its fame can be attributed to the popularity of the series it spawned. The Jedi Knight series is potentially the most recognized game series set in the Star Wars universe, lauded for unique and fun gameplay and some of the best lightsaber mechanics in any Star Wars game. However, if I had only played this particular game and someone were to tell me that it continued on to grow into such an acclaimed series, I would have laughed in their face at worst and discount them as trolls at best. 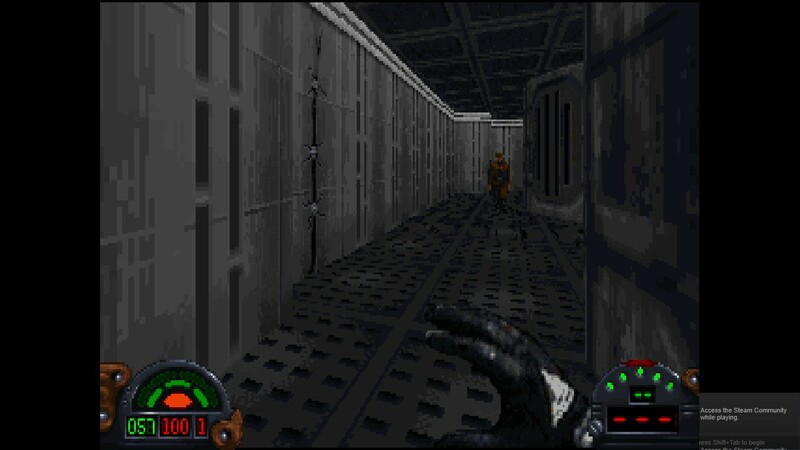 Now don’t get me wrong, Dark Forces isn’t bad. In fact, its really quite good. Not great, but definitely good. It’s short and sweet, the kind of game that is upfront about what it is, doesn’t require any emotional investment and little mental investment. Its kind of like a chocolate croissant you buy on the way home from work or school. It tastes pretty good, tides you over till you get home, and you enjoy it while it lasts, but doesn’t have quite enough chocolate filling to be remembered after the last bite is gone. 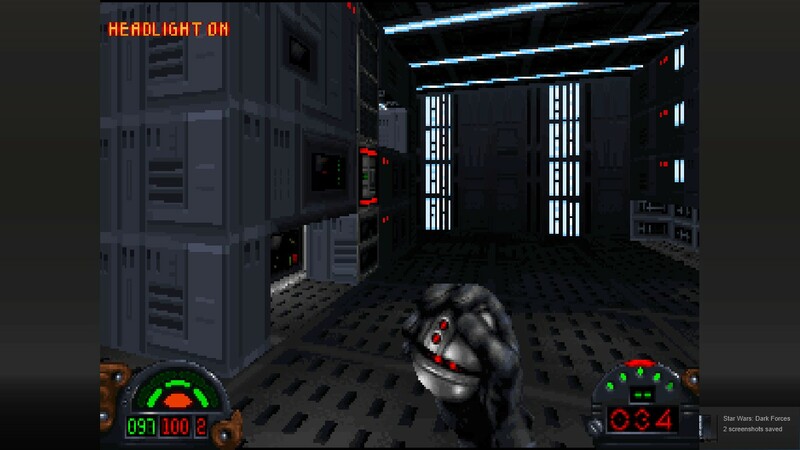 Star Wars: Dark Forces is available on GOG.com and Steam. *I’ll take a one month (well that turned out to be a bit longer) break from Back in Your Day for work-related reasons (Boo! ), and because I’m building a new gaming PC on which I’m going spend all my gaming-time catching up on newer releases (Yay! ), so BIYD returns in June with the legendary Post-Apocalyptic Role Playing Game!